If you spend 20USD in my shop during one transaction, you will get 20% off, no coupon needed. 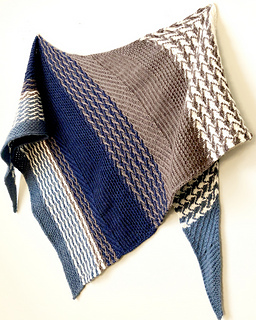 Sunchaser is a sideways triangular shawl that is worked tip to tip with simple increases. It alternates between Garter and various slipped stitch sections and ends with a clean edge i-cord bind off. Slipped stitch Herringbone stitch uses one color per row to achieve fun yet classic appearance with irresistible texture. The wrong side also looks interesting. Sunchaser is a sister pattern to the Rainchaser hat and cowl set that uses the same stitch to create a gentle gradient. 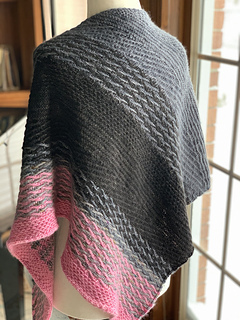 This shawl was designed to use a gradient fade of four skeins to achieve cohesive faded effect. 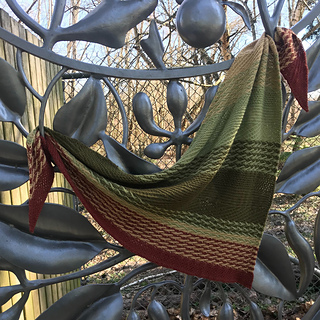 But nothing is stopping you from using a bit more contrast to really make the shawl your own! Dani of Sunshine yarns will have an update on Friday, March 22nd with 6 different kits here! Slipped stitch section are worked with US#8/5.00mm and Garter stitch section is worked with US#6/4.00mm to offset the difference in gauge since slipped stitches generally tighten the fabric significantly.